Call now, to book your next unforgettable event! We are VINTAGE VOCALS and we perform eclectic vocal music for all occasions. We are unique among performing groups, due to the variety of venues in which we perform and the musical styles we present. Our venues range from military bases to the Ga. Renaissance Festival. 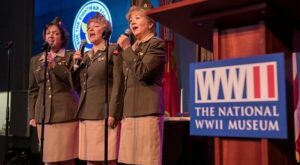 You can catch our act belting out 40’s swing tunes in Andrews Sisters style uniforms one day and singing folk songs on the the S.A.M. Shortline excursion train in denim and bandannas, the next. We are wives, mothers and teachers who have made a fantasy life out of music that has been successful beyond our wildest dreams, transporting us overseas on a USO tour and forming friendships both stateside and abroad. We have performed at churches, state parks, military bases, corporate events for Delta, AT&T, GE, Southern Company, Continental Airlines, HBO and many more. We are particularly dedicated to our military veterans and patriotic to the core. Check out our photo album to see Vintage Vocals in action!